Round up #162: Amazon’s auggies, should Amazon buy Toys “R” Us? Should Amazon buy Toys R Us? This is just speculation on my part, just kicking around an idea and I’m interested in your thoughts on it. Toys R Us recently filed for Chapter 11 bankruptcy. They expect to keep their approximately 1,600 stores open through the holidays (that includes their Babies “R” Us stores). Bankruptcy certainly doesn’t mean you are going out of business…necessarily. It appears they are massively in debt (I’m seeing five billion dollar figures). Many articles cite Amazon as a major reason for their troubles…that got me thinking. Should Amazon just buy Toys “R” Us? They recently bought Whole Foods, and that was expensive, of course. I’ve been saying that I think one of the reasons is for the physical locations…that they may start using them as staging areas for non-Whole Foods sorts of items (like expensive gadgets at the holidays) so they can deliver them more quickly. Toys “R” Us would give them something like four times the number of locations as Whole Foods did…and in different sorts of neighborhoods. As a former brick-and-mortar retail manager (bookstore, gamestore…), I’ve felt like, certainly in the past decade (TRU is something like seventy years old), the big toy chain has managed their stock pretty well. They move a lot of things on and off the shelves, and even on Black Friday, you don’t tend to see empty shelves or boxes on the floor. My guess is that it would be a good base for an “express fulfillment center”. Amazon could make the Toys “R” Us stores function somewhat like their Amazon Books stores: intentionally set up to be “showrooms”. Customers could interact with toys and electronics, and then (most of the time) order them online from Amazon for quick delivery. There would be some stock on hand for “store to trunk” purchasing, but that wouldn’t be the focus. Regular readers have probably been a bit bored 😉 by my speculating that Amazon was going to get into VAM (Virtual/Augmented/Mixed/Merged Reality) in a significant way this year. I’ve been careful not to limit that to any sort of idea of Amazon creating VAM hardware. 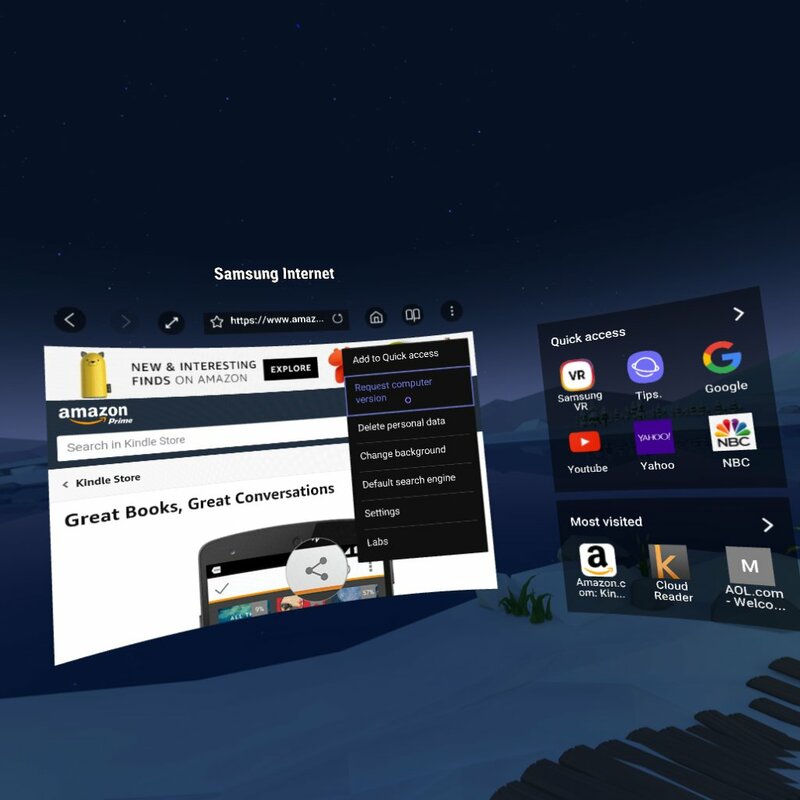 I would count it as a “hit” if they just added a Prime Video app to the Samsung Gear/Oculus store. (I’m in VAM pretty often, and the main thing I do there is watch Hulu or Netflix…that’s where I think the real disruption is right away, with expensive big screen TVs). However, Augmented Reality (much more than Virtual Reality…with AR, you still see the world around you with overlays…with VR, your reality is “replaced”) is, I believe, about to become a common part of many people’s lives. “Ambient computing” is another revolution people cite, but the two can merge. “Ambient computing” means computing which is always available…you don’t say, “Now I will turn on or log on to a computer”, you just ask a question or interact in some other way. works, for the most part. You just ask a question to “the air”, and get an answer. will be a tablet with hands-free Alexa as an option. Augmented Reality Ambient Computing (ARAC…I just made that up) would be a game changer. There needs to be a breakthrough in wearability, but basically, it would be able to put images into what you see, and you would be able to interact with it easily. An initial level would be it overlaying items of your choice, things which wouldn’t interact with the environment, but I think we are past that. I can virtually put mustaches, glasses, or full faces on actual people in real time, that will move with their heads. ACAR would mean that I could ask for something whenever I wanted. For example, as a vegetarian, I could be in a grocery store (maybe an Amazon-owned Whole Foods) and ask it to show me which products on the shelf are vegetarian. Green lines might “appear” around the foods that fit my request. The next level would be for the artificial intelligence to come more into play, so that it already knew I was a vegetarian and put those green lines on for me (even if I hadn’t thought to ask for them)…but that’s getting ahead of the game. says that Amazon is working on “smart glasses” that would be Alexa-enabled. The idea, at least, would be to be able to interact with Alexa any time, anywhere. The article suggests Amazon might have something innovative: bone conduction audio. Rather than sticking headphones into or over your ears, you “hear” the audio through soundwaves traveling through your bones. Personally, I have a “thing” about having my ears touched…it really creeps me out! I do use earbuds, but I’m always aware of them. Having a bone conduction device would mean that you could hear what was going on around you easily when you weren’t invoking Alexa…and still hear when you were. You could do the conduction with a glasses type device…the stems of the glasses would do the conduction. However, this could be a lot more than that…the lenses (if there are any) could be used to display information to you, as I suggested with the green lines. There are a lot of interesting rumors out there: a Google Home Echo Dot type device, an Amazon homecam, and we know that there will be standalone auggies (no phone, no computer tether) this year (at least, they are scheduled to be released). It’s going to be an interesting holiday season! I would bet on more Amazon hardware announcements soon (Fire TV, maybe Kindle EBRs) and service announcemnts…I’m thinking with the next week. However, November 20th is the 10th anniversary of the Kindle…I’m going to put together something for that (and invite you to contribute), so they might tie something really innovative into that anniversary (like the auggies). I’ve been tweeting out “On this date in geeky history” on my @TMCGTT account, and today (September 20) is George R.R. Martin’s birthday! George R.R. Martin born at TMCGTT. who I will eventually get into TMCGTT…like many authors who are best known for works which might be assigned in school, Sinclair also write geeky works (including the Gnomobile). What do you think? Should Amazon buy Toys “R” Us? Would you be interested in Amazon’s auggies…or anybody’s? What would they have to do before you would be willing to try them? Is it your birthday? 🙂 Feel free to let me and my readers know by commenting on this post. Is this the first of Amazon’s virtual/augmented reality announcements? 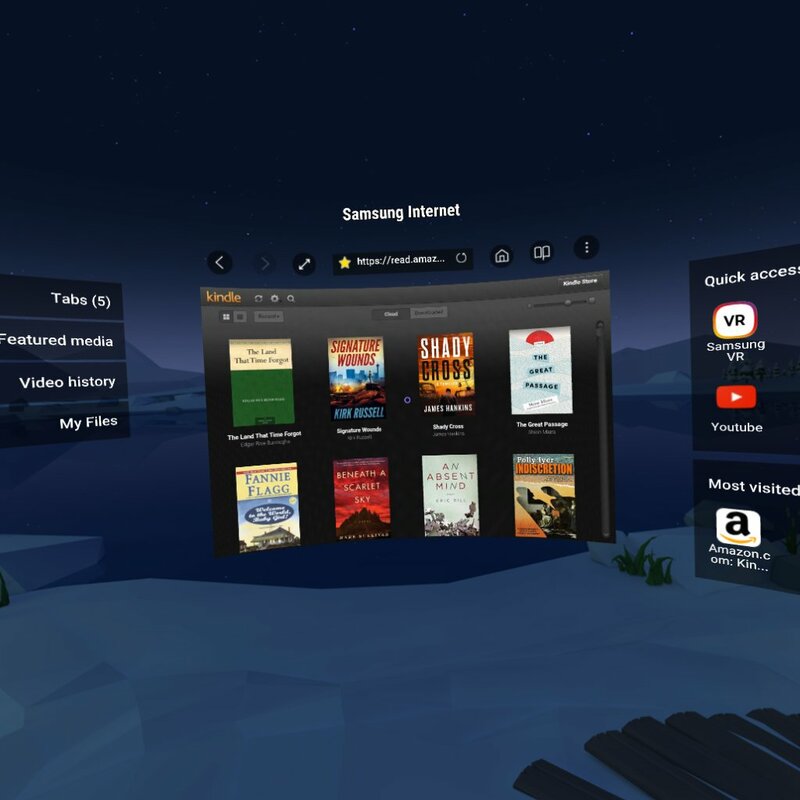 and the one to which I devoted the most space, was Amazon getting into the Virtual/Augmented Reality (what I call VAM: Virtual/Augmented/Mixed-Merged reality), in particular with content. while not stating it explicitly, certainly gives us some strong hints about the future of “Vamazon” (so to speak…VAM Amazon). The lead is that this is a collaboration between Amazon and Robert Kirkman/Skybound (creator of The Walking Dead). That makes sense: The Walking Dead is a cultural phenomenon and very popular in the key age demographic. The press release mentions Skybound’s Virtual Reality series (Gone and Lies Within). More telling is Amazon’s Sharon Tal Yguado (Head of Event Series) description of what’s to come: “…we plan to explore immersive worlds”. That’s exactly what VR is: an “immersive world”. Kirkman says they want to “… tell the best stories in the most unique and creative ways in an effort to always break new ground.” Also mentioned is Amazon’s vast resources…you don’t especially need vast resources if you are only making a video series. I think they may do more than one thing, but I think this would be a real possibility: a phone-based Augmented Reality game, like Pokemon Go…but with zombies. It might not exactly be a game as you might think of it now. Social Pokemon Go groups are a big thing…it could be some sort of social adventure with zombies in the real world that told a genuine narrative story. There could be a competition, or some sort of prize involved. I would also expect at least one straight up VR series. The phone-based game wouldn’t require Amazon to have its own hardware. It’s interesting to me that they seem to really be tying this into Prime Video. I think of VAM as something different than video, but Prime Video is a strong brand…stronger than the Amazon Appstore, for sure. Could Amazon develop the killer…er, undead app that gets average people to invest their entertainment time in VAM? Could be…and I think this is just the beginning. 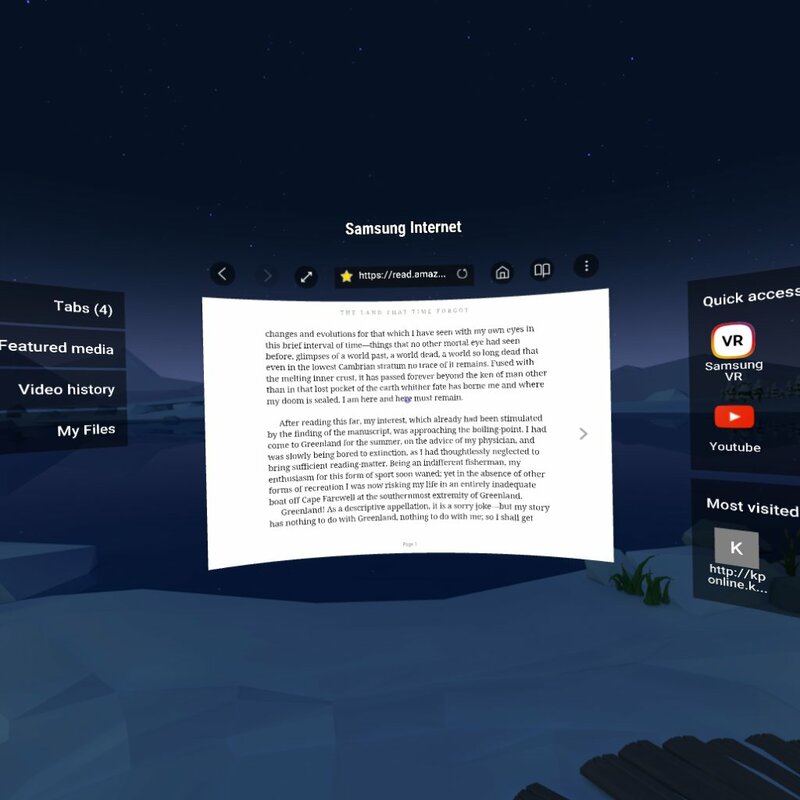 My interview about (and IN) VR with Len Edgerly…and giveaways! about Virtual/Augmented Reality…and at my suggestion, we actually did the interview in VR. blog back in August of 2009. In that case, I really could bring special expertise. I had been a manager of a brick-and-mortar bookstore, and I was a techie from way back, so I had a special insight on electronic books (e-books). In the case of what I call VAMM (Virtual/Augmented/Mixed/Merged Reality), I’m coming at it from the point of view of an observer of and commenter on popular culture. I do think that there is a significant Amazon/book element coming to VAMM, and coming fairly soon. I write about movies, TV shows, games (I also managed a brick-and-mortar gamestore), tech…a very wide array. I think I’m pretty good at understanding pop culture. One year, I called eight of the last nine eliminations on American Idol in order, before any of them happened. My Oscar Prediction contest produces results which tend to be more than 90% accurate (and I do quite well myself). I called (not publicly) the successes of Jim Carrey (based on one interview on TV where he did “facial impressions”), Darryl Hannah (after seeing Bladerunner), Big Brother (before it aired one episode in the USA), and more. I’ve been on the Kindle Chronicles several times before and it’s always been a great experience. Len is a former professional journalist, and we shared an enthusiasm for the Kindle. I noticed Len had been broadcasting in 360, and I knew he was at least dabbling in VAMM. So, a couple of months ago, I suggested that we actually do an interview in VAMM space. One reason for that was that I knew you could record VAMM sessions there, which would mean that our audiences could see and hear us later. Unfortunately, when the time came, that feature (vCast) had been taken offline for improvements. I played around with the settings, and found something I liked. Apparently, sometimes while I was talking, I had my mouth too far away from the microphone…with the headset on, I wasn’t aware of that, but again, Len was able to boost the sound. I loved doing the interview! 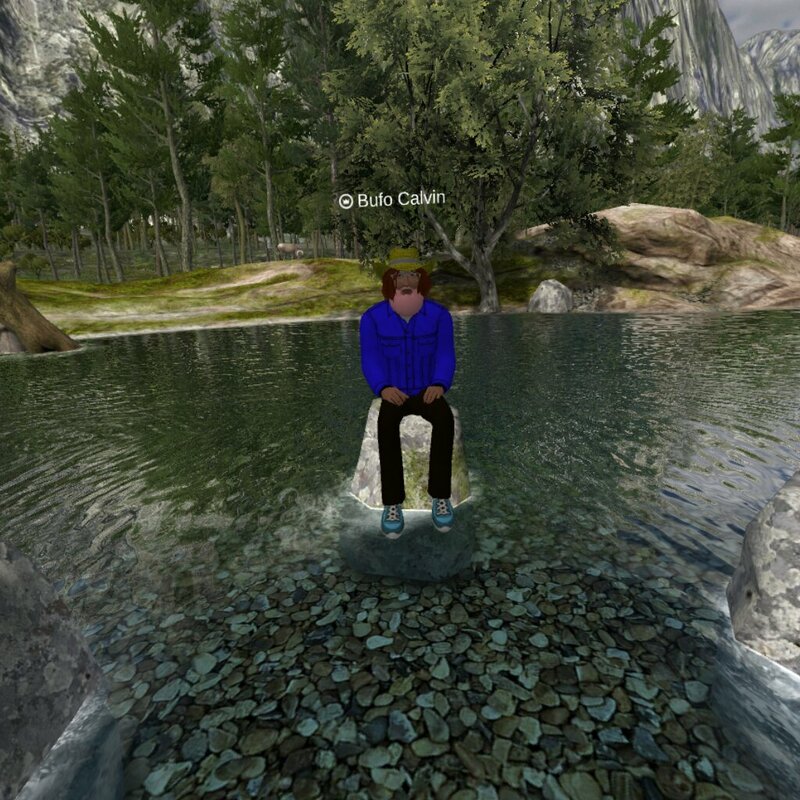 That’s a screenshot of my avatar sitting on a rock in a wilderness river…we were talking about how interacting in VAMM space compared to doing videocalls. I should mention that my avatar is randomized: hair color, skin color, body type (including gender), and so on. I could have made an avatar that looked very much like me (in fact, I did that at one point), but my regular readers know that I don’t like to identify inherent characteristics…I like people to be known (online) for what they think and feel and how they express it. My thought is that I’ll randomize a different appearance many times. That was a lot of work: I think it took perhaps half an hour. I can automate that process outside of vTime (by generating random numbers in a spreadsheet, although it would be great if they would just let people pick an entirely random avatar. I think one error I made was making a choice in every category. I figured that “facial hair” would include a “none” choice, but I don’t think it did. That means my avatar has a hat and glasses, but I need to include a “no glasses” option (for example). I’d say the biggest takeaway is that I expect Amazon to get into VAMM significantly before the holidays at the end of this year. Now, being in VAMM space wasn’t perfect, by any means. Len disappeared for me a few times…it seemed to me like I was able to be on consistently, but it’s possible it looked to Len like I disappeared. The other thing was that I couldn’t have any notes I could see…and I made two big mistakes. I’m usually good and careful about crediting people properly, but in this case, I gave the wrong title for a book and for a video series. I want to try to make up for that for those two, even though they are properly linked on Len’s site. What I’ve decided to do is Amazon giveaways. I mistakenly called it “The Fourth Revolution”…there is a popular book by that name, but it’s entirely different. I did identify “Scoble and Israel” as the authors. I think this a well-written and insightful book by a couple of people with an excellent track record of predicting what will happen with technology as it relates to business. I’ve recommended it to people at my company: I think if you have a major consumer presence and aren’t starting to prepare for VAMM interactions in the next five years, you are missing an opportunity. The second one is a VR specific comedy series, and I unfortunately really butchered the name (badly enough that I don’t want to repeat it here and mislead people). and they really understand what Virtual Reality means (while being funny at the same time). They completely (and intentionally uncomfortably) bring you into the experience. It is a bit racy…maybe “edgy” is better. Since this is a video series which is part of your Hulu subscription, I needed to find something to giveaway. and therefore Virtually Mike & Nora, but it should be fun even if you can’t. 🙂 It’s going to depend on your phone. To benefit that very creative duo, I’m requiring that you watch a short YouTube video (under two minutes) from them about the show before you enter. I’m going to give away one of those, via random draw of the entries during the period. Again, my apologies to both pairs of artists…hopefully, this will help discovery of both of these good works. I am requiring that people follow Kris Calvin on Amazon to enter…I want you to know when the second Maren Kane mystery is released, and other titles Kris may do. Thanks again to Len for taking the VAMM adventure with me for our interview (interVR?)! Note: feel free to connect with me in vTime. I’m listed there as Bufo Calvin. If you have any questions or thoughts about this, you can let me and my readers know by commenting on this post.